Kent Cox in front of a banner proclaiming “THE LEGEND HAS RETIRED” at a small party held at the Delaware County Jail Thursday afternoon. This Saturday, Cox will be retiring after spending the past 30 years there as a corrections officer. For those 30 years, Cox has worked to maintain safety and security at the Delaware County Jail and said his favorite thing about his job is the camaraderie he’s developed with his coworkers at the jail. The high points of his career directly correspond to the two pins on his uniform designating both times Cox saved the life of an inmate in the jail, once in 2002 and once in 2014. Sergeant Stacie Beck-Taylor, Cox’s supervisor, said Cox has been an invaluable asset to the jail. Beck-Taylor said the jail is going to be a “different atmosphere” after Saturday. Cox was honored at the Delaware County Commissioners Session on Thursday morning and Martin said as far as the sheriff’s office knows, Cox is the first employee to work at the jail for 30 years. Martin said Kent served the United States Air Force for four years and has lived in Delaware County his whole life. The commissioners extended “sincere congratulations” to Cox for his service to the county. Delaware County Commissioner Barb Lewis said she was “overwhelmed” by Cox’s service. When discussing post-retirement, Cox said he plans to travel. Cox’s final shift will conclude at 7 a.m. Saturday. 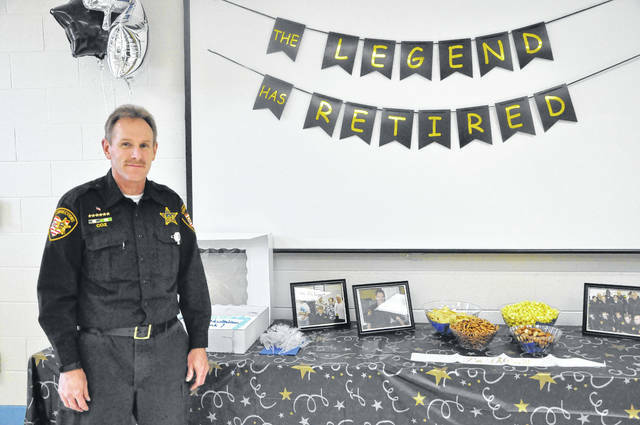 https://www.delgazette.com/wp-content/uploads/sites/40/2018/04/web1_DSC_1435.jpgKent Cox in front of a banner proclaiming “THE LEGEND HAS RETIRED” at a small party held at the Delaware County Jail Thursday afternoon.